Here’s the south-east corner of Burrard and West Hastings (looking east) in 1974. The simple, modern looking 2-storey building was occupied by the Bank of British Columbia. We’re reasonably sure this was a McCarter and Nairne design from 1949 for Burrard Building Operations Ltd. In 1952 it was called the Burrard Building (the name was moved once the new much bigger building was completed a few years later to the south). The early tenants included stock brokers and insurance companies, including the Fireman’s Fund Insurance Co. The bank show occupying the building in 1974 was the second business with that name, and they were entirely unrelated. The first bank premises are still standing, and we featured them earlier in the life of this blog. The second bank was the creation of W A C Bennett in 1966, designed to allow more local control for making decisions on loans to BC businesses. By the mid 1980s there were $2.7bn in funds and over 1,400 employees, but serious management problems led to the bank being absorbed in 1986 by the Hong Kong Bank of Canada (today’s HSBC). Across the lane to the south the edge of the first Bentall Building can be seen – a five-storey concrete building that was the first substantial office to be built in the city after the Second World War, in the early 1950s. It was almost certainly designed by Bentall’s Dominion Construction, probably with input from Charles Bentall. Today it’s Commerce Place, a silver reflective office complex designed by Waisman Dewar Grout Carter and completed 30 years ago. Here’s a view from Granville of Robson Street. It dates back to 1932, and on the right is the Johnston-Howe Block that we featured several times a while ago. Next to it, to the west, was the McLuckie Building that we’ve also see before. The building to the west is the Hotel Georgia, which even today is one of the biggest buildings on the block – certainly one of the most impressive. Graham and Garrow’s design (it’s not really clear which office carried out the design details) was always overshadowed by the Hotel Vancouver – initially by the second hotel across the street and then by the third further to the west. The hotel wasn’t mentioned in architectural publications of the 1970s or 1980s, but more recently as some of the older buildings in the area have disappeared, the simple but classic design has become more appreciated. The roof initially wouldn’t support any loads, but now is used as part of the hotel. The ballroom, the Hotel Georgia’s most famous feature was removed, and then completely restored to its original appearance. The basement bar, with distinctive arched ceilings and a wood floor was restored with added contemporary features. Less obvious additions include a geothermal field, photovoltaic panels and a green roof. The much later parkade next door was demolished and an office and condo tower, designed by IBI/HB was added. Today the hotel is part of the Rosewood Group, and is undoubtedly more classy than it was for many years before. We’ve seen this corner when it was developed by E D Farmer in the 1920s. We also saw it when Charles Nelson represented it somewhat misleadingly in the early 1900s. Here’s how it looked somewhat more accurately in 1902, without the early use of Photoshoppe. (We’re not completely positive, but we think that Nelson’s postcard image really does show Robson Street west from Granville around 1900 – it was a very quiet street and only partly developed at that point). You’ll also notice that the ‘Nelson’s Corner’ sign was another addition, although Nelson’s had huge awnings proclaiming the company’s presence. Charles Nelson had also decided in 1894 to open a Chilliwack drug store similar to his City Drug Store in Vancouver. The business known as ”Nelson’s Drug Store” was first located in a building opposite the Chilliwack Progress newspaper premises on Yale Road East. The store specialized in the sale of drugs, patent medicines, stationary, books, and assorted fancy goods. A year later the business relocated into the new Masonic block at the corner of Wellington and Young Street. The store now offered many new products, stocking the latest in periodicals, magazines and novels and led to a name change as the ”Nelson Drug and Book Store”. In 1897 they produced a seed catalog as the Nelson Seed Store, and during the summer introduced Nelson’s Lime Fruit Juice. By October a circulating library commenced operation. The business was sold to Dr J C Henderson and H J Barber in May 1902. Mr Nelson sold his business and retired in 1910. As with others we’ve observed, he immediately turned to civic service. He was a Park Commissioner in 1910 and President of the Canadian Pharmacists Association from 1911-1912. As well as his Melville Street home Mr Nelson had a house called ‘Bellevue’ in West Vancouver. The the Municipality of West Vancouver was incorporated in 1912, after separating from the District of North Vancouver. With only 1,500 residents it might seem that almost everybody had a shot at the mayoral position, but Charles Nelson was the winner. The job title was actually ‘Reeve’ , and even here, Mr Nelson was apparently pursuing business opportunities. The West Vancouver Archives have a picture of his house with a large sign offering “Belle Vue lots for sale” right next door. 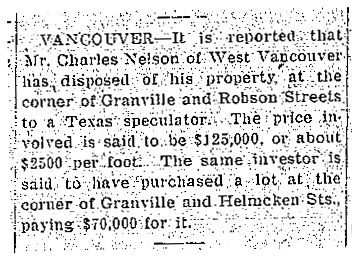 The new owner of the drug business in 1910 was W M Harrison & Company, but apparently Mr Nelson hung on to the property. He only sold in 1916 (as the BC Record cutting shows) and then to Mr E D Farmer who didn’t redevelop the site until the early 1920s. In 1917 the Owl Drug Co were lessee, and they hired architects Dixon & Murray to carry out $1,000 worth of repairs to the building. Today it’s a recently completed office and retail building designed by Musson Cattell Mackey (MCM). Here’s Nelson’s Corner as shown by drugstore proprietor and postcard published Charles Nelson at the turn of the last century.Nelson’s Drug Store Limited was founded in Vancouver around 1886 by Charles Nelson who was born in Manchester in England in 1862 (according to the census – although 1861 in a biography). He initially came to Winnipeg in 1882, and to British Columbia in 1886. He founded a drug company, located at 100 Cordova Street on the corner with Abbott Street in the heart of Gastown, and lived in the West End on Melville Street through the 1890s. At the end of 1899 or early in 1900 he added this second store at 801 Granville. We haven’t been able to trace the architect of this new structure, or confirm whether Mr Nelson developed it for his own occupation, although we’re almost certain he did. In 1901, Nelson formed the Nelson, MacPherson, Sutherland Drug Company with seven stores, but by 1903 the partnership had failed and Nelson only retained the Granville store shown here. In the year the new store opened Charles Nelson was aged 38 and his wife, Edith, 26. The census in 1901 says she was born in Nova Scotia – which she was – but she’d been in the city longer than most residents. She was born in 1874 in Cape Breton but her father, Peter Cordiner moved to Granville in 1879. In 1900 Charles and Edith had a six year old daughter, Beatrice, Winifred was 4 and a new baby, Gordon, had been born the year before. Charles Nelson seems to have constantly looked for ways to expand his business. He added a seed company for a while, and he published postcards sold in his stores. This image of his new store, which makes it look like it’s located in Gastown’s angled grid, was published as a Nelson’s postcard very soon after the building was occupied.